It’ll shortly be the end of the line for HearFromYourMP, so let’s take a little time to look back on why we made it, and what we learned along the way. HearFromYourMP was one of mySociety’s earliest projects, launched in November 2005. As we said back then, we wanted to “improve long term relationships between MPs and constituents by giving both an easy, trusted way of discussing local issues”. In other words, it was, like many a mySociety project, an attempt to break down the barriers between the ordinary citizen and their elected representatives—even if, as with a large percentage of the population, they didn’t know who those representatives were. You may be wondering why the world needed such a thing. Did MPs really need a way to talk to constituents? After all, that’s one of their key duties, and surely one that they’d already got down pat. To really understand the context into which HearFromYourMP was born, you have to consider that this was fairly early in the history of the internet. Twitter hadn’t been invented, and Facebook was just for US college students. It certainly wasn’t a given that every MP would have a website, and it was more than likely that they contacted their constituents on paper rather than via email. HearFromYourMP, among other things, acted as a gentle way to encourage MPs to join the 21st century, or, as it was known back then, (cue futurist music) cyberspace. If you enter your details, we’ll add you to a queue of other people in your constituency. When enough have signed up, your MP will get sent an email. It’ll say “25 of your constituents would like to hear what you’re up to. Hit reply to let them know”. If they don’t reply, nothing will happen, until your MP gets a further email which says there are now 50, then 75, 100, 150 — until it is nonsensical not to reply and start talking. And 5,701 users did just that, even before the official site launch. In other words, HearFromYourMP gathered a ready audience first, rather than assuming that we needed every MP to be on there before we could open it to the general public, which might have been the conventional way of doing things. And even though there was no compulsion for MPs to sign up—beyond that niggling email in their inbox, telling them that people were waiting to hear from them—they did. By January 2007, there were almost 100 MPs on board. Apparently the Liberal Democrat membership currently stands at 44,576 while, as I write, admittedly some five years beyond that two to three year forecast, there are 230,455 constituents registered on HearFromYourMP. This kind of usage of ‘the crowd’ went on to become a bit of a mySociety hallmark, and something that you can see to a greater or lesser extent in most of our following projects. Newsletters tend to be a one-way conversation, with the MP broadcasting the wonderful things he or she has done lately. Conversely, HearFromYourMP was built to encourage debate: users could respond to the mail-outs. Everything remained accountable, since the conversations were published on the site for anyone to read. To prevent abuse, users could only comment on an MP’s message if they were signed up to receive mails within that MP’s constituency. Today, as we have seen, over 230,000 people are signed up to hear from their MPs. Over half of all MPs have used the service to send out a newsletter. Meanwhile, 78% of the UK population can’t name their representative in Parliament*. Nonetheless, we’re confident that our decision to close HearFromYourMP is the right one. 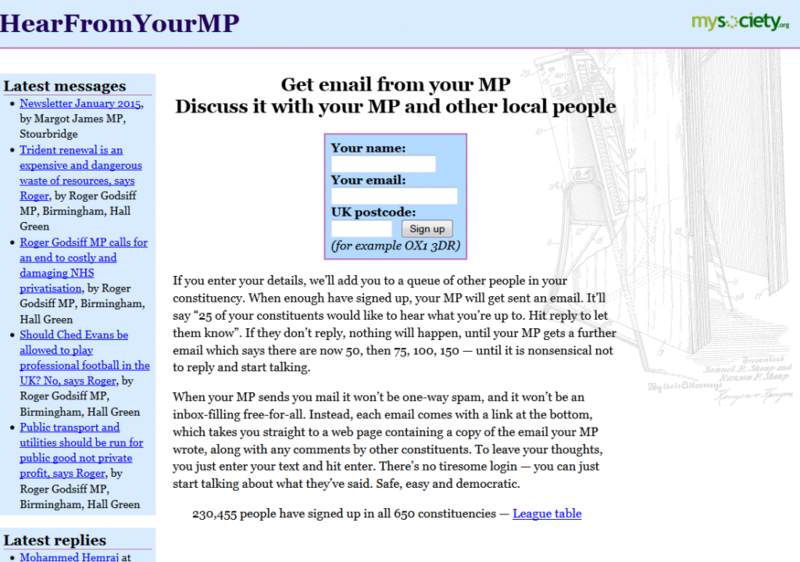 People can still use our other sites, TheyWorkForYou and WriteToThem, to discover who their MP is. And once they’ve found out, there are now many channels via which an MP can engage with their constituents—some, like Twitter and Facebook, where exchanges can be held in public. We’ll be sorry to see HearFromYourMP go, but we’re glad that it played the part it did. Thank you to all its users, whether you’re a constituent or an MP. Over the last weekend of November 2009 a group of 21 mySociety staff, volunteers and trustees went to a house outside of Bristol to wrestle with the question of what mySociety should build over the next 12 months. This was the fourth time we’ve done it, and these meetings have become a crucial part of our planning. This year, we were talking not just about what new features to add to our current sites, but also about the possibility of building an entirely new website for the first time in a couple of years. The discussions were lively and passionate because we know we have a lot to live up to: not only is our last major new site (WhatDoTheyKnow) likely to cross the 1 million unique visitors threshold this year, but we understood that there were people and organisations who weren’t there who would be counting on us to set the bar high. A chunk of the weekend involved vetting the 227 project ideas that were proposed via our Call for Proposals. I’m going to write a separate post on our thoughts about that process, but if you look at the list below you may spot things that were submitted in that call. One nice innovation that helped us whittle down our ideas from unmanageable to manageable numbers was a pairwise comparison game to help us prioritise ideas, build custom for the occasion by the wonderful and statistically talented Mark Longair. In other words, we used the technique that powers KittenWar.com to help decide our key strategic priorities for the next year: after all , if we don’t, who will? Future business (ie the calendar) for events in the House of Commons, including a full set of alerting options. Publish a standard that councils can use to post problems like potholes in their databases to FixMyStreet and other similiar sites. Template requests in WhatDoTheyKnow so that users are strongly encouraged to put in requests that are well structured. After the next general election, email new MPs with various bits of info of interest to them including their new login to HearFromYourMP, their page on TheyWorkForYou, explanation of how WriteToThem protects them from spam and abuse, a double check that their contact details are correct, and a introduction to the fact that we record their correspondance responsiveness and voting records. Add to WhatDoTheyKnow descriptions about what kind of public authority a specific entity is (ie ‘school’, ‘council’) and the information they are likely to hold if FOIed. Show divisions (parliamentary votes) properly on debate pages on TheyWorkForYou, ie show the results of a vote on the same page as the debate where the issue was discussed, with full party breakdowns on each division. Help Google index TheyWorkForYou faster by creating a sitemap.xml file that is dynamically updated. 1 day per month developer time that customer support guru Debbie Kerr gets to allocate as she see fit. Premium account feature on WhatDoTheyKnow to hide requests so that journalists and bloggers can still get scoops and then share their correspondance later. Add Select Committees to TheyWorkForYou, including email alerts on calls for evidence. 4. Much more time consuming things and things around which there is less consensus. NB – We do not currently have the resources to do everything on this list next year – it is an ambitious target list. Relaunch our Volunteer tasks page on our sites, keep it populated with new tasks, specifically allocate resources to handhold potential volunteers. Allocate time to see if any of the ideas that we didn’t build could be parcelled into volunteer tasks. Secondary New site (if we have a lot more time than we expect): Exploit extraordinary richness of Audit Comission local government target data in a TheyWorkForYou-like fashion. FixMyStreet to become international with a) maps for most of the world b) easy to follow instructions explaining how to supply mySociety with the required data to us to enable us to turn on FixMyStreet in non UK countries or areas. This data would includ ie gettext powered text translation files, shapefiles of administrative boundaries, and lists of contact data. Carry out usability testing on TheyWorkForYou with then help of volunteer Joe Lanman – then implement changes recommended during a development process taking up to 10 days. Add to TheyWorkForYou questions that have been tabled in the house of commons but which haven’t been answered yet. Add a new interface for just councils so that they can say if a problem on FixMyStreet has changed status. Phew. And that’s not even counting the projects we hope to help with in Central and Eastern Europe, our substantial commercial work, or the primary new site idea, which will be blogged in Part 2. 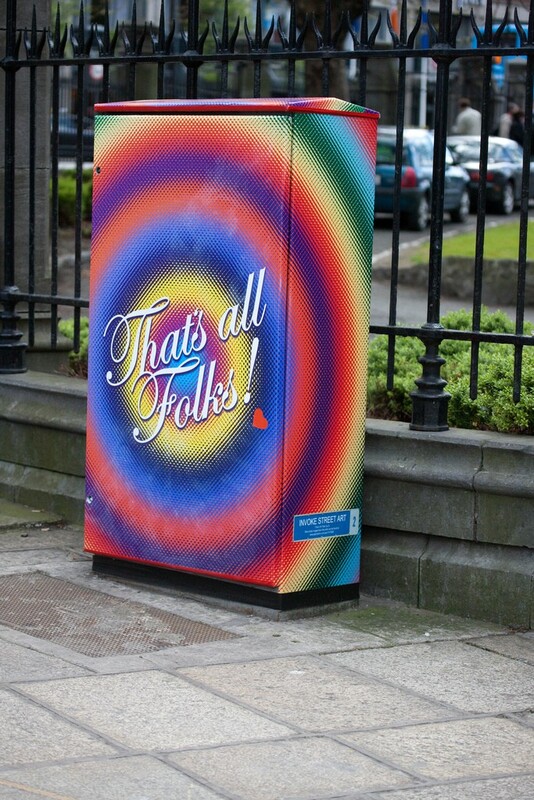 We updated our boundary and postcode database at the start of the week (apart from two wards in Scotland that I misspelled and updated on Tuesday, sorry), so hopefully everyone in the country can contact their representatives at WriteToThem or have their postcode recognised on HearFromYourMP or TheyWorkForYou. This applies especially to a small number of councils, such as Bradford, for which the boundaries had completely changed at their last election and which we were unable to get working until now – apologies for the inconvenience. Related to this, and for interest, on 1st April, a number of councils are being abolished as their county councils become unitary authorities. The district councils within Durham, Northumberland, Cornwall, Wiltshire, Shropshire, and Cheshire/Chester all disappear – Cheshire becomes two unitary authorities called Cheshire West and Chester, and Cheshire East. Lastly, Bedford borough council becomes a unitary authority, and Central Bedfordshire council covers the area previously covered by Mid Bedfordshire and South Bedfordshire. Parliamentary boundaries in England and Northern Ireland are changing, but these do not take effect until the next general election – until then, your constituency and MP remains the same. Who will be the 100th MP to use HearFromYourMP? 98 MPs have now sent at least one message via HearFromYourMP. Who will be 100th? Should we tell them? Should we give them a prize? Will there be an auction style-frenzy at the end? Should I be thinking about more important things? Only one of these questions can be answered with any certainty. Today is the first anniversary of the launch of HearFromYourMP.com. Whilst a bit lower profile than some of our other sites, being driven mainly by email, HearFromYourMP has had a very pleasing first year. Not only have over 25,000 people signed up across the UK, but perhaps more remarkably 84 MPs have used the service to talk with (not to) their constituents. That’s about one in five MPs asked making use within the first year, which we guess must be amongst the fastest adoptions of a new communications tool ever by parliamentarians. The most important thing to remember about HearFromYourMP, though, is that it is designed to be there for the long haul, gently engaging with that 44% of WriteToThem users who have never written to a politician before and coaxing them into a slow but personal relationship with their representatives. And as a final thought, I note that the Liberal Democrats had 72,721 members in 2004: I wonder how long it will take this little birthday site to get there? Exactly a year ago, people started signing up to HearFromYourMP. Something in the heady post-General Election excitement made us decide to start harvesting email addresses, before we’d even built the site. At first it was just a hacked together page (and database) on www.mysociety.org, which we sent people to from WriteToThem. Matthew and Chris then cleverly mutated it into the full live site it is now. The first person to sign up was James Cronin (one of our trustees), at 11:17:17 on 5th May 2005. 5701 of you had signed up before we even launched the site on 21st November 2005. By the end of 16th December 2005 all 646 constituencies had somebody waiting to hear from their MP. The last constituency to be signed up was Newry & Armagh, by the 8864th constituent. You can see the graph of signups over the year. We’ve now got 16049 signed up (oops, 16050…), one year later. We’ve sent 66 messages from MPs, and 53 comments from constituents. The fun will be the next few years, as the figures waiting to hear from each MP (check on yours) gradually ratchet up.